The Iveco Daily gets a much needed dose of modernisation for 2019, with lower running costs, cleaner engines and choice of car-like driving aids. It's not without its flaws, but the 2019 Daily is still one of heavyweight champions of the large van sector. 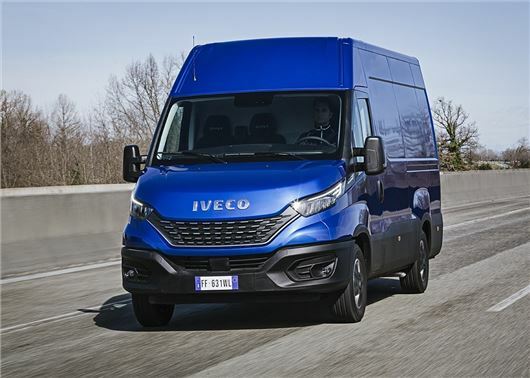 Popular with large building companies and delivery firms, the 2019 Iveco Daily delivers small-truck-like carrying capability, with its maximum gross vehicle weight (up to 7.2 tonnes) well ahead of the 5.5 tonnes you get with the Mercedes-Benz Sprinter and Volkswagen Crafter. The basic mechanical platform of the 2019 Daily remains essentially the same as before, with three wheelbases and five load lengths providing between 7.3 to 19.6 cubic metres of load space. This means all vans get a maximum load width of 1800mm, while load lengths range from 2610mm to 5125mm. Things are familiar under the bonnet too, with the Euro6 Fiat-sourced 2.3 and 3.0 turbodiesels providing 120, 140, 160, 180 or 210PS. Iveco hasn't released any economy figures, but it's promising 10 per cent fuel savings at lower urban speeds. The engines will also meet WLTP and RDE fuel and emissions standards. The Daily gets an electric handbrake too, which should make life easier for short drop delivery drivers. We sampled the Daily 2.3-litre 180PS and it is a capable - if somewhat noisy - work mate. The four-cylinder diesel has plenty of low-gear pull, with 430Nm of torque at 1500rpm, but it's very vocal under heavy acceleration. The six-speed manual gearbox is temperamental too with notchy changes on both the up and downshift. Thankfully this can be fixed by specifying Iveco's excellent eight-speed automatic gearbox. The Daily is offered with an impressive array of driver tech, designed to take the strain out of motorway driving. This includes a lane keep assist system, which prevents the van from wandering out of its lane due to side winds or the driver becoming distracted. Adaptive cruise control is also available, which maintains a safe distance between the Daily and the vehicle in front. The van gets an automatic emergency city braking system too, which applies the brakes between 3-31mph if the on-board radar system detects a potential impact with another vehicle. Another important change under the metal is the introduction of all-electric power steering, which makes the Daily almost effortless to drive at lower speeds in and around town. The system features a city mode, which requires 70 per cent less effort to turn the wheel - perfect for navigating small city streets or guiding a long wheelbase van into a compact parking bay. Things are less impressive at higher speeds though, with the electric steering numbing the van's handling and providing much less feedback than the hydraulic system found in the old van. Things are not so bad on the motorway, but tackle a series of twisty B roads and the Daily's vague steering makes it difficult to judge the handling and rear-end grip levels. The cabin of the Daily is comfortable and large enough to accommodate three adults. Most versions get a seven-inch touchscreen as standard, with Apple CarPlay and Android Auto. This means the infotainment screen mirrors the mobile phone display, while steering wheel controls make it easy to answer calls safely while on the move. However, while the cabin is large, comfortable and logically laid out, it feels somewhat lacking in quality compared to the Transit, Sprinter and Crafter with cheap plastics and switchgear. The dashboard design is easy to navigate, but the infotainment screen is set quite low and this makes it difficult to read the nav map without looking away from the road. You do get lots of useful storage and the door pockets are large enough to accommodate a small laptop or tablet computer. The Daily has plenty to appeal to small businesses who want truck-like carrying capacity with van-like running costs. Unlike its rivals, the Daily uses a separate ladder frame and body construction and this allows it to carry much more than its body built rivals, while providing more flexibility for converters who opt for the chassis cab model. Not everyone will require such a capable load hauler and it could be argued that - for lighter 3.5 tonne van work - the Sprinter, Transit and Crafter are much more accomplished vehicles. However, if you have been longing for a van that can shift payloads up to four tonnes, the Daily will be an easy choice.